When people ask me what is my favorite place to dive, and I answer "Kona," they often point out that Hawaii doesn't have the colorful soft corals of Fiji or the biodiversity of Raja Ampat. That's fair enough, but I wonder how many of those 1,300 species of reef fish those divers actually identified during their week in Indonesia. As one of the world's most isolated archipelagos, Hawaii has far fewer species of marine fish and invertebrates than many other tropical dive destinations but far more that are unique to the area. Hawaii has the world's highest rate of endemism for both marine fish and invertebrates. It is the only place, for example, to see the gaudy male flame wrasse flashing its crimson and saffron fins at its harem in a courtship display. In the lee of two of the most massive seamounts on earth, with currents bringing in clear blue water from the open Pacific, Kona consistently offers great diving conditions, making it one of the best places on Earth to see subjects such as turtles, blackwater plankters, mantas, sharks, dolphins and whales. Over the years I've collected memories of remarkable sights: a killer whale munching down on a thresher shark, a false killer whale offering me a fish, one purpleback flying squid cannibalizing another, pillow lava erupting underwater, a pod of sperm whales rubbing against each other during a social get-together, a transparent larval lobster riding the ocean currents on the bell of a sea jelly, a school of 200 hammerhead sharks lazily cruising past me and many other scenes. Freediver Sandy Hammel explores a coastal lava tube known as Skull Cave. Most visitors will experience only a small part of the magic that Kona offers. Your experience will be shaped largely by your guide. There are many diver tribes here — the fish heads, the nudibranch freaks, the dolphin huggers, the manta maniacs, the offshore tribe, the blackwater cult and more. Many of the guides who work for the various dive and snorkeling operations are excellent photographers, and many of them post publicly on social media. Search for guides who have immersed themselves in your topic of interest, contact them beforehand to get a spot on a tour they lead, and you will have worlds opened up to you that could take you years to discover on your own. With my bad eyes, I wouldn't in a lifetime find all the nudibranchs that an enthusiastic guide could find for me in a few days of diving. Nothing is guaranteed in nature, and even if you dedicate a full week to a particular subject you're not likely to see everything you would like. Most people try to cover all the bases, giving themselves a chance for anything, but this means less opportunity for deep immersion in any one topic. Consider a few of Kona's signature ocean experiences. The manta night dive (or snorkel) is unique to Kona and has a high probability of success. On any night you might encounter dozens of reef manta rays doing barrel rolls to feed on the plankton attracted by more dive lights than you have probably ever seen in one place. Offered year round, the dive is best enjoyed in summer when there is less surge and manta numbers tend to peak. The Manta Pacific Research Foundation has identified more than 270 manta rays in their Kona study area. The blackwater or "Pelagic Magic" dive, another Kona innovation, has recently been emulated around the world, but Kona — with predictably calm seas and deep ocean water close to shore — remains one of the best places to experience the world's greatest migration. As the sun sets and the blue ocean turns to black, myriad strange creatures, mostly tiny and transparent, rise from depths of hundreds to thousands of feet up to the surface, where they can frustrate the heck out of anyone with a camera. For best results, go with an experienced guide, and stay close during the dive. The better guides will spot amazing things you might not even notice. A very bright light is also a big help. The experience might feel a little like a trip to outer space, and it usually takes more than one "spacewalk" to get the hang of it. Offshore wildlife hunts can be done in many places, but Kona gains a huge advantage from having blue oceanic water and mountains that block the prevailing winds. The key is to dampen your expectations. You will see something on every reef dive. Offshore you may see nothing or you might find something completely different from what you were looking for. Maybe last week there were pilot whales and oceanic whitetip sharks, but this week it's sargassum fish amid marine debris. Next week it might be whale sharks. The Hawaii Uncharted Research Collective has recorded whale shark sightings in every month of the year, with a mean of three sightings per month over the past two years. In winter, humpback whales are abundant. It's illegal to swim with them, but sometimes one approaches a boat close enough for photographers to do a "hang-cam" over the side. I became a believer in this technique after seeing the fabulous work of Marty Wolff on Maui. Several companies specialize in offshore excursions. Ask around, and find the operations with guides who have a reputation for finding things. Ask who will be your guide on the day that you book. Bring reef-safe sunblock. into the ocean in front of a double rainbow. Lava tubes are caverns and tunnels that often house interesting and rare light-shunning creatures. The longer and darker the tube, the stranger the critters are inside, and the more dangerous is the passage. Even short, shallow tubes can be hazardous when surge causes them to huff and puff, so match your penetrations to your training, experience and the conditions of the day. Many of the caverns have skylights that create haunting visual effects as the sun passes overhead. (Zebrasoma flavescens) that graze algae off the turtle's shell at a cleaning station. One of the beautiful things about an island that drops straight off into deep water is that many good dive sites can be accessed easily from shore. It's not always the best way to experience a site, as nearly everything is better with a good guide. If you're competent and experienced, however, you don't need a boat to enjoy lava tubes, reef dives, turtle cleaning stations and even deep drop-offs. Extensive information is available online. Shore diving is best enjoyed when there is no ocean swell, which is a more common condition during the summer months. A reef manta ray (Manta alfredi) feeds inside a school of bigeye scad (Selar crumenopthalmus). yellow tang (Zebrasoma flavescens) while feeding at night. (unless there is large surf). Navigate with care to avoid surfacing in the middle of the very busy boat channel. 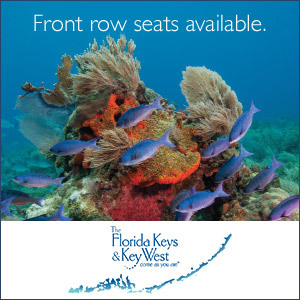 This site offers a variety of reef fish and invertebrates and the possibility of seeing sea turtles, mantas, eagle rays, sandbar sharks or spinner dolphins. There's also a reasonable likelihood of encountering one of the female tiger sharks that rotate through the area, with the probability peaking during the summer months. These sharks are wild animals that have not been conditioned to interact with humans. They generally keep a respectful distance from divers but may behave unpredictably if fish scraps are dumped from a fishing boat heading back into the harbor. Dolphin swims are a controversial activity that the National Oceanic and Atmospheric Administration (NOAA) wants to ban. For now, boat tours that hunt the dolphin pods are still available, and sometimes the dolphins are friendly. It is also possible to swim from shore to some of the dolphins' daytime resting areas, but NOAA sporadically tickets for that as a violation of the Marine Mammal Protection Act. A humpback whale (Megaptera novaeangliae) calf swims alongside its mother. card. My most enjoyable days in the ocean are spent with friends doing relaxed dives on near-shore reefs, where we can compare notes about the rare and unique creatures we see. I usually come home from a day of reef diving with a full card and often with a shot of a fish that is new to my collection of Hawaiian endemics. The shallower portions of our reefs are sadly still showing the effects of the 2014-2016 bleaching event, but below about 40 feet the reefs look pretty good, and most of the regular inhabitants are still around. You will not find "fish in a barrel" photography like in some places with large marine reserves. Two-thirds of the Kona coast is open to aquarium collecting, and nearly the entire coast is open to spearfishing. Therefore a macro lens of at least 100mm focal length is recommended for fish photography here. It adds to the challenge, but the water is clear, so you don't need to be super close. Mixed-gas rebreather divers regularly come back with pictures of fish that are new to science. How cool is that? Hawaii was just recovering from the false missile alert panic when volcanic fissures opened on the southeastern flank of Hawaii Island at the summit of Kilauea. Sensational reporting and poor timing unfortunately led potential visitors to cancel Hawaiian vacations, resulting in millions of dollars of economic losses. But Hawaii Island is called the Big Island for a reason. It is more than 4,000 square miles — larger than Rhode Island and Delaware combined. In popular diving areas such as Kona, which lies along the island's western shore, the effects of volcanic activity from southeastern Kilauea are relatively minor. When volcanic gases reach Kona, all ash and glass will have dropped out, and the sulfur dioxide will have been converted into sulfate particles. The only effect divers might notice is that sunny mornings more often give way to cloudy afternoons. The upside is that last-minute bookings are easier to accommodate due to cancellations that might have evolved from misguided divers' angst about the effects of the volcanic activity. Lava erupts from fissure 8 (Puka Ewalu) of the Kilauea Volcano east rift zone and flows through agricultural plots to enter the ocean. Author's update, Aug. 14, 2018: The volcano has gone quiet. Only a small puddle of lava is down in the bottom of Fissure 8 for the last week, and lava is still draining out of the tube system into the ocean. No more homes or roads are threatened, earthquakes have almost stopped, no more collapses at the summit, and emissions are the lowest they've been in years. Air quality in Kona has improved dramatically — it might be even better than it was before the recent phase of the eruption started. Of course, everything could be different next week, but chances are it will continue to be fine here in Kona for a while. See more of the magic that Kona offers in Doug Perrine's online photo gallery.